America’s Oldest Microbrewery and Michigan’s Original Craft Brewery! Offering award winning Ales & Lagers since 1862! 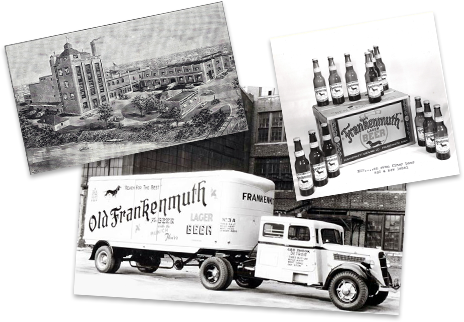 In 1862, John Matthias Falliers and his cousins William Knaust and Martin Heubisch built and opened the Frankenmuth Brewery just north of the Falliers’ property, where the Frankenmuth Brewery continues to stand today. Since then, the brewery has operated under many names, including Cass River Brewery and Geyer Brothers Brewing Co., before settling on the Frankenmuth Brewery name during the 1980’s. Today, our Gold Medal Taproom is open to the public seven days a week. For tastings and a full brewery experience, the taproom provides the opportunity to enjoy 21 draft beers complimented by an inspired craft-centric menu. Throughout the year we rotate our draft lineup to highlight a unique variety of 36 different styles of craft beer brewed fresh onsite. 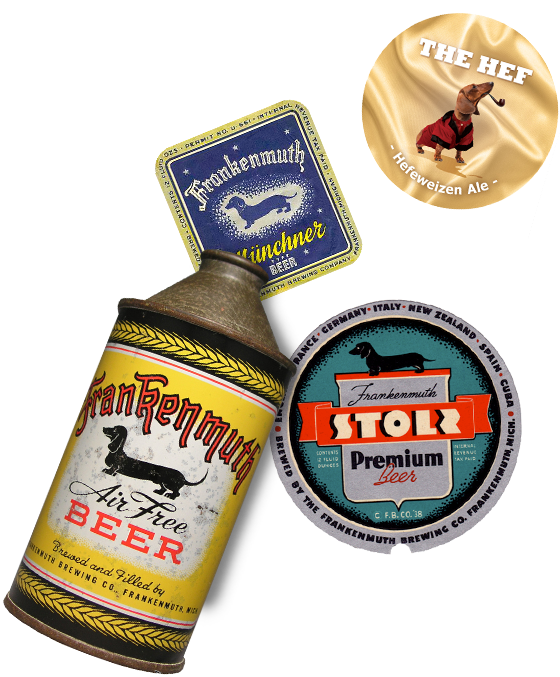 Frankie the Dachshund has been featured on our beer labels, advertisements, and marketing materials dating back to as early as the 1930’s, making Frankie nearly 85 years old (or almost 600 in dog years)! The history of Frankie originated with one of the brewery’s early owners, John Geyer. 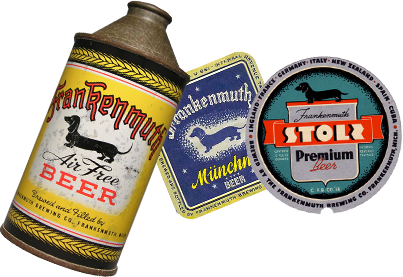 As legend would have it, Geyer owned a brood of purebred dachshunds and used the image of Frankie, his top dog, in ads, signs and packaging for the brewery. Frankie has made quite a name for himself as the company mascot over the years and continues to play a huge role in representing the Frankenmuth Brewery’s “dog-gone good” craft beer. With Frankenmuth Brewery’s expanding production of its year-round, seasonal, and limited release brews, our craft beer offerings are more diverse and better than ever. Whether you like your craft beer light or dark, hoppy or malty, uniquely flavored or traditional, the Frankenmuth Brewery is sure to have the perfect craft beer for everyone. Frankenmuth’s Brewmaster, Steve Buszka, joined the brewery in 2014 to support the company’s rich German brewing traditions, though he’s also brought his own signature brewing influence to Frankenmuth. Steve began brewing professionally in 1991 and has served as the head brewmaster for breweries such as Bell’s (when it was still named Kalamazoo Brewing Company), Potosi Brewing Company, and O’So Brewing Company, among others. Since joining the Frankenmuth Brewery, Steve’s original brewing approach and expertise has already been recognized, particularly with our Batch 69 American IPA , which was awarded the 2015 World Expo of Beer Gold Medal.